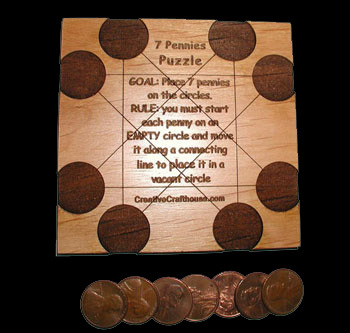 The object of this puzzle is to place 7 pennies (included) on the board in 7 different circles. The rules are simple: You must start each penny on a VACANT circle and move it along a connecting line to place it a circle. May drive you crazy at first, but this is one both old and young will enjoy. Made in Creative Crafthouse's shop, entirely on the laser machine. I'm enjoying this pennies puzzle. Lots of fun and not that easy. super duper easy once you figure out the secret - and fun as heck when the 'light comes on' LOL! and it actually includes the 7 pennies needed to play the game! good one and looking forward to playing with my other purchases from this company!